It's not a common problem —but knowing that is no help when it's just happened to you. AppleInsider shows the steps that can save you a trip to an Apple Store. We get asked about this a lot. Your iPhone or iPad has been working just fine but now you can't plug your Lightning cable into it and get the phone to charge. There's been no apparent warning and you can't see any problem, but it won't go in all the way and click into place. 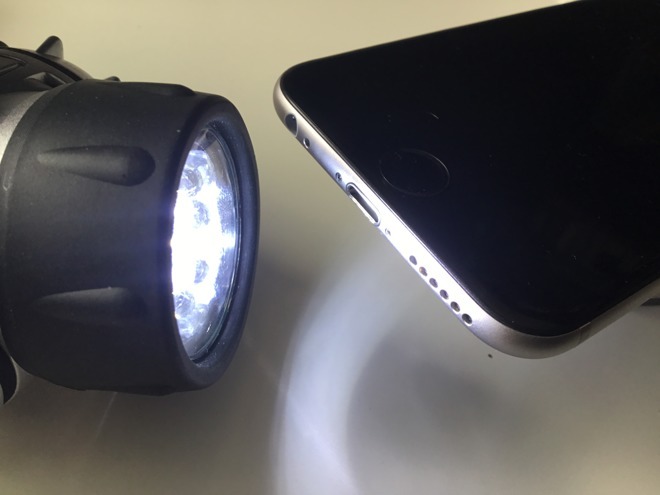 The most likely thing is that the iPhone's Lightning port is blocked. If it's just happened to you, all you want is the fix. We'll talk about prevention later —but first here's what to do. Since you know what you're doing, this is going to seem so obvious that it goes without saying —but it's so important that it must be said anyway. 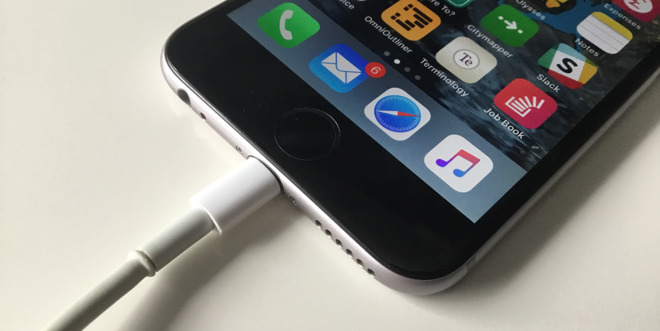 If you're not careful, you could seriously damage your iPhone Lightning port. Also, do not attempt this with your MacBook or MacBook Pro's USB-C slot. The port design is not the same, and if you break off the center pins on the female end of the plug, you'll be very, very sorry. Unfortunately, this is not guaranteed to work because it's possible there's already some serious damage and only Apple can fix it. Or, the cable might be dead —but we suspect you tried a new cable already. However, what's most likely is that you've got some debris in the port. Even though it is so small that you can't see it, it's stopping the cable from handshaking with the iPhone. Switch it off and get some tools, starting with a bright light. Shine that light into the port and see if you can spot anything. Remember that dust and lint will not only have got in there but they will have been pressed in firmly each time you connected the cable. So look to the sides and back of the port. You will find things often enough that it's worth looking frequently. But, when this just happened to us, we would've sworn there was nothing there. We even took this photo so that we could pinch out and examine it. Still, try gently shaking the phone to dislodge the debris. Do not blow into the port! If at all possible, get a can of compressed air. You will also need some kind of pick but choose very carefully: don't use anything metal. A small brush like a clean and unused toothbrush works well. Rub it across the port, getting the fibers into it, and see if it loosens anything. 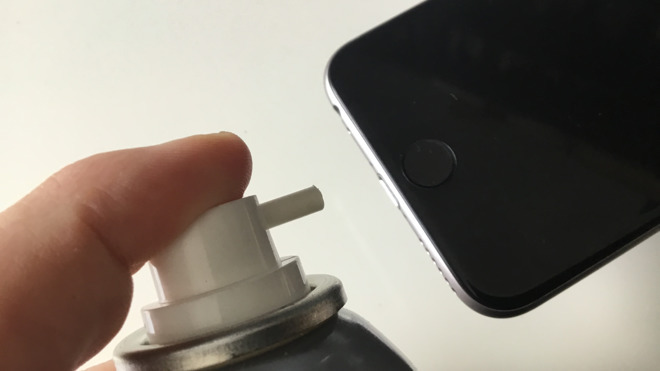 Use the compressed air to force out anything loose. You may well see a small clump of material come out. Even if you don't, periodically try fitting the Lightning cable in again. When it works, stop messing with your port and just be relieved. Until it works again, go up a notch with a stronger tool. The next we'd suggest is that you take a Q-Tip and, with scissors, cut diagonally across the plastic between the buds. That plastic is hollow so cutting it this way gets you a little pick. Really, really carefully scrape inside the port. We're not kidding. Pick really, really carefully. 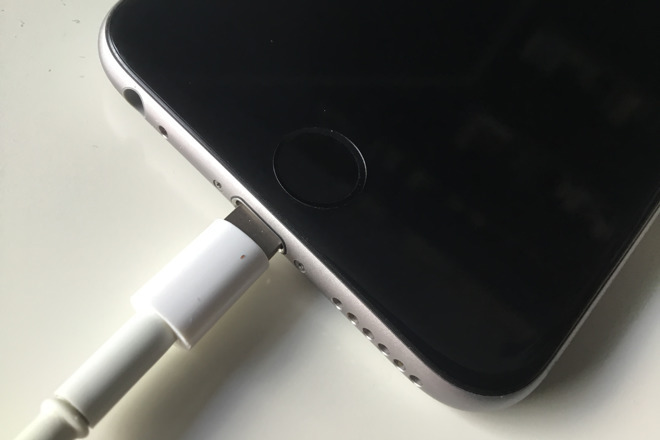 Avoid scraping the top and bottom where the Lightning connectors are: you're aiming for the back of the port instead. This is a divergence point. If you're not comfortable with this step, just make an appointment at a Genius Bar. Take a sewing needle and use the rounded end in the port. Extremely gingerly scrape at the back of the Lightning port. Again, you can often see something coming out. If so, it may be so small that you aren't even sure you saw it. We wondered if instead of debris, we'd scraped some metal off the phone. When we tried the cable, we saw that things were a little better. It still wasn't working, wasn't connecting, but it went in further. So we scraped on with the needle and after a few minutes, the cable connected just fine. If you've tried a known-good cable already, and have progressed through the clean-out steps as fas as you're comfortable, and there's still no charging, it's time to get help. Set up an appointment with Apple or an authorized service provider to take a look at your iPhone. Sorry. You might have a hardware problem that a clean-out won't fix. We've said that it's debris and we've mentioned lint. If you have your iPhone in a shirt pocket, in particular, it is going to pick up things in this Lightning port and eventually it's going to be enough to cause a problem. Look at the plug on a Lightning cable. It has gold connectors on the top and bottom but nothing at the actual end. 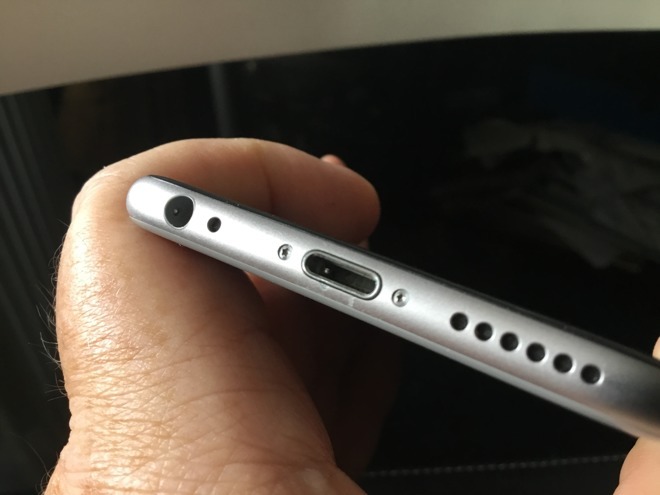 In the port on your iPhone, there are the same gold top and bottom and the cable clicks into place when these connectors all align. The debris is building up at the base of the port and the problem comes when there's enough that the cable is kept from going all the way. Even though there's nothing on the tip of the Lightning plug, that part has to go all the way to the back of the port or the connectors won't line up. In our case it was just the smallest of flecks of dust: so small that we could not see them. Sand is a big problem here too, especially if it wedges in there really firmly. The odds are that it's going to take a long time before this happens to you. You may, seriously, have sold the phone before you even came close to getting it. Equally, though, if you just bought your iPhone secondhand then you may be well on the way to having the problem. What will prevent it is having an iPhone case that has a flap over the Lightning port. Just being able to have that port covered over until you're charging will stop this happening. We did say that you get no apparent warning, that one day the cable just won't click into place and that's true. However, for a long time before this happens, we've seen instances where the connection is sporadic, and the charging bleep sounds at random. You've plugged in, it's charging away fine and then there's a bleep. It bleeps, wakes up the screen and carries on charging. What's really happened is that the connection has failed for a moment and one possibility is because of this debris build up. So listen out for that or get a case for your iPhone.